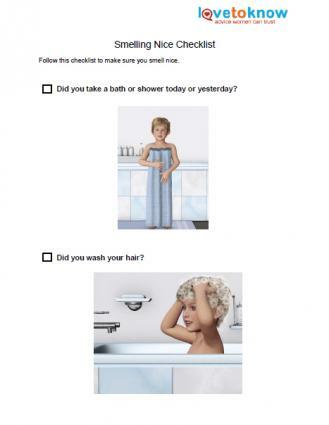 One of the easiest ways to get kids to stay squeaky clean is to use printable checklists. You can hang the printouts around the house, allowing kids to reference the printables as they perform the self-care routine. For instance, a sheet on tooth brushing for the bathroom makes for a quick and fun reminder. Many websites, including LoveToKnow Kids, offer free hygiene printables for kids. Consider which routines you'd like to reinforce, and then choose the printable that best communicates this message for your child. If you have a younger child or a visual learner, be sure to choose printables that include pictures. To avoid overwhelming your child, focus on just one hygiene routine at a time. Once your child has mastered that routine, move on to the next. Work toward self-sufficiency by reducing your involvement in the routine. Soon your child with be looking and smelling clean all on his own! Print this checklist about smelling nice. Although children usually don't need to worry about deodorant or antiperspirant, there are times when things smell a little less than fresh. To keep your kid smelling sweet, it's a good idea to use printables that help reinforce general good hygiene and bath time practices. Slippery Soap Craft can be a great way to get kids involved and make them feel as though they have some control over the process of getting clean. Print out the templates in either black and white or color. Free Printable Behavior Charts offers several printable charts on many different kinds of hygienic activities, which make teaching your child hygiene straightforward and easy to learn. Print this hand washing reminder. Hand washing can help prevent the spread of illness and germs, so it's very important that kids learn how to wash their hands properly. To help kids understand the printable, go over it with them step by step. Then stand back and watch them use the printable to wash their own hands. You can step in with any extra reminders. After they've mastered the process, the printable will help them stay on track and do a thorough job staying clean. Softsoap has a site called Lather Up for Good Health. In addition to the online activities, there are many printable sheets that will help teach your child hand washing basics. You'll find coloring pages, a hand washing chart, and even a printable poster. Carex offers a list of resources and printable lesson plans to help teach kids about hand washing while making it fun. Print this helpful reminder about brushing! Teaching children to brush their teeth is an important part of establishing a habit that will last a lifetime. It is essential to start brushing teeth as soon as the first teeth appear. For babies, use a very soft toothbrush and brush for the child. As children gain motor skills, they should begin to brush themselves, although you should always double-check their progress and hit any areas the child might have missed during brushing. Colgate offers many different projects and games for preschool dental health to help make tooth brushing time fun for children. In addition to online activities and games, they offer quite a few printable worksheets. Kids Tooth Dr. offers a printable storybook about a child's first visit to the dentist. Work with your child to fill in his/her name and information and make the visit less frightening. Ed Helper - The lessons within the unit are aimed at grades 1-6 and cover topics such as washing hands, bad breath, personal hygiene, dental hygiene, acne, and having a good hair day. All of the items are printable, although some do require a small membership fee. Unicef.org - This site offers a prinatble life skills-based hygiene education pdf that includes examples of lesson plans for 6 to 9 year olds and 9 to 12 year olds. The best thing to do is to start with one daily habit at a time when your child is small, and integrate the behavior into his or her routine from an early age. 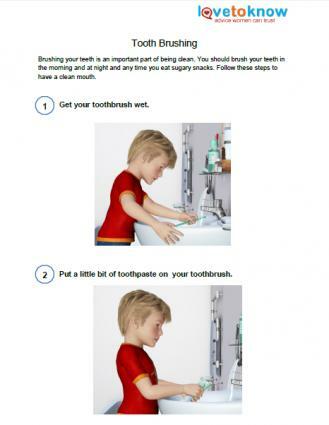 You'll be less likely to have problems getting a child to brush his teeth at 10 years old if you've trained him at 2 that he must brush his teeth twice a day. However, even if your child is older, it is never too late to learn good habits. Use positive reinforcement, reminders, and rewards. With a few printable reminders and a little work from you, your child will have excellent hygiene routines that will last a lifetime.